It's a common practice in some organisations to fix their internal interest rates to a standard rate determined periodically by an external entity, such as Central Banks. The interest rate source is defined when creating a Loan Product using declining balance methods as explained in Interest Calculation Methods in Loans. All the accounts created under a loan product using Index Interest Rate will be reviewed at a frequency which is also determined when creating the product. When the accounts are reviewed, if the Index Rate remains the same, there will be no changes in the repayment schedules. On the other hand, if the Index Rate changed after the latest review, the repayment schedules will be updated to reflect the new interest rate. To add an Index Interest Rate you have to add first a Rate Source. Available Rate Sources: Interest Rate, Value Added Tax, Withholding Tax. Index Rates can only be edited or deleted if the start date is either the current or a future date, or if it is not being used in any account yet. To edit an Index rate click on the correspondent icon > edit the Index rate > Save Changes. To delete an Index rate click on the delete icon > Delete. Organisations might be required to collect taxes on the income generated from loans interest, fees or penalties, and/or to withhold taxes on interest paid to deposit accounts. These taxes are usually called Value Added Tax (VAT) in the case of Loan Products, and Withholding Taxes in the case of Deposit products. Taxes are set up at the Product Level, using a previously defined Tax Rate. For Tax details, please see the relevant sections in the Loan Product Setup and Deposit Product Setup articles. Just as it happens with the Index interest rates, also taxes source, rates and start date need to be added under Administration before being used. The first step should be to add the tax source. 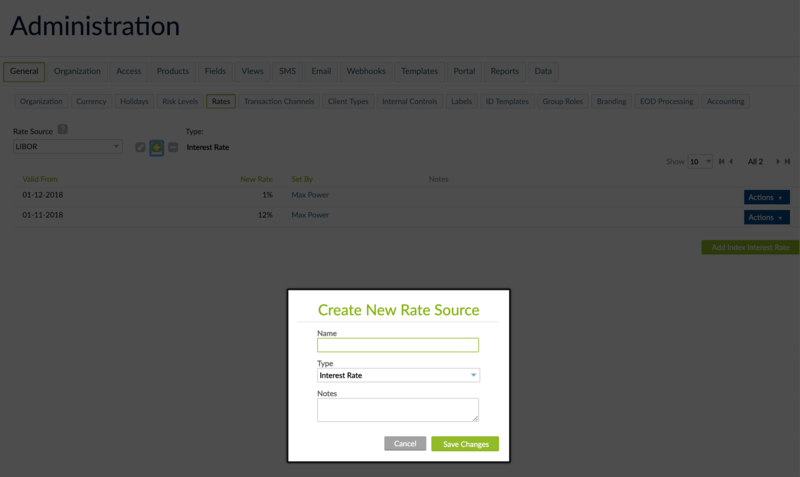 To do so go to Administration > General Settings > Rates > click the plus icon > enter the source's name > choose the Rate Source Type > Save Changes. Once the tax source is defined, you can start defining your Taxes rates. 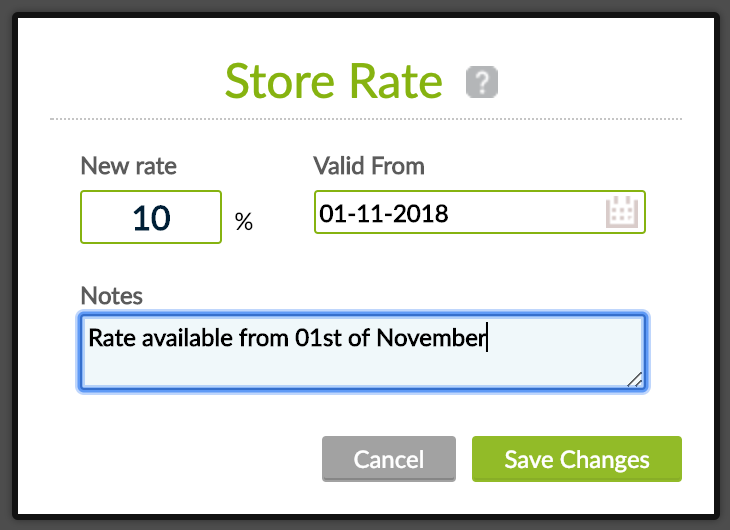 Choose the appropriate Tax source > click "Add Vaule Added Tax" or "Add Withholding Tax"> enter the new rate > enter the date when it should be valid from > Save Changes. Taxes can't be enabled or disabled on a product if it already has active accounts.